Anthem, previously known as Project Dylan is Bioware’s new IP, It’s what they’ve had the main team working on while what was left worked on MEA, Right away you can tell which game had the focus when in the opening scene, you just see the faces, so good, The facial animations in this game are insane! It’s a good start, so let’s see what else this gameplay reveal trailer showed us. As a quick catch up, Anthem is about the last dregs of humanity trying to survive and come back in a world where they are not the kings anymore. 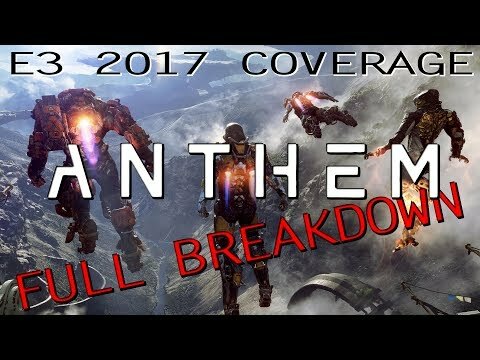 Working in a similar way to destiny, Anthem appears to be an MMO RPG that can also quite easily be played in single player, The trailer starts with you in a marketplace that has a post-apocalyptic feel, the camera shoots up to see a Battle of Hoth style giant walking robot which I originally thought may have been some kind of Guard, but after a closer look, the packs on it’s back insinuating it’s a mule, hauling resources from one place to another. As far as I know, this is the only evidence of other cities or settlements, but for me this kind of confirms it. You continue through the market then come across a man with amazing facial animations, tee hee hee, ok I’ll stop! He says not freelancers, which confirms you aren’t in any army or proper military, which considering the work you do in the game means no real government is present, either that or you are in some kind of no man’s land and the governing body resides in a place very far away, essentially, I find it unlikely that anything other than militias and mercenaries will be in this game. You gain your first quest to save some folk, it seems quests are very fluid and immersive without a big backstory and an accept button. This guy on the right here is wearing armour, there is no showing of aliens yet so I assume there aren’t aliens and that he is either an Android, Cyborg or genetically enhanced human The narrator referred to us as heroes, but for whom? There HAS to be a leader of this fortress, he also says it like there is only one fortress or city, but I expect that is to keep the hype down and protect the integrity of the story. Time to get into this badass looking Exo-suit. So here, your friend Paul decided to jump in the colossus Exo-suit while you jumped in the Ranger, these can only be described as classes of suits, The structure here appears to be that you have a class of suit, and that class can then have specific types of custom doodads, The narrator mentions that each player will have multiple suits that they can heavily customise, You even comment on how Paul just got a new Mortar meaning that each suit class doesn’t have a static weapon or ability, I would say the Javelin classes control some base stats as well as the types of custom parts you can augment it with. Also, the fact that he just dropped in right next to you is kinda awesome, he definitely didn’t do this manually as his nameplate appeared slightly before him so this was a teleport or summon, either way, it will make playing with friends a whole lot easier. Eye candy goodness, both landscape and the ability to fly, Whether flying is available from the start is unknown, sure the Perch type fortress lends itself to require a jetpack to come and go, but this could be one of many ways, it’s very possible there is some kind of fast travel or elevator for use before you attain your jetpack, they are level 32 and 34 after all. Also, this terrain is just beautiful, it’s massive differences in heights makes my sense of wonder tingle, Those height differences also insinuate you do get the jetpack fairly early if you don’t start with it of course. The graphics just get better, it’s so beautiful, I can’t wait to immerse myself all up inside this. Oh, look! a Fiend beating on some Taurgs. So, she doesn’t interact with the big guy, this kinda confirms that the world doesn’t level to you, if it did then you’d just kill it for loots, In the classic RPG way, I’d say that big guy is an Elite, meaning that while this area seems suitable for levels 32-34, that big fella is above, probably 40 or higher, or requiring a full team to down at the level of this area. But that’s basing on the way MMO RPG’s of the past logically work, this is Bioware, I wouldn’t be surprised if they completely redesigned the way MMO’s work. That shot just showed a whole lot of awesomeness, first off that a simple slender river could actually be super deep with treasures and enemies in it, but also how deep these ruins go, the ruins on the right are clearly metal and highly technological, showing that this is a world that was super advanced and has fallen to ruin in some way, some big way, and it’s been a super long time since it happened. Also, no breathing meter means swimming ain’t no thang. The name of this place implies a dungeon or raid of some kind. These guys up the top are not speaking English and are wearing armour, it is not possible to tell whether they are robots or living, but the tribalesque spikes on their back insinuate they are sentient, they would be cumbersome so are not purely logical, so they are definitely either living or high-functioning AI, Just on the combat used here, our main used a weapon, some kind of high damage low rate of fire weapon like a shotgun, the reticule is large and the mag and max ammo next to it fit a combat shotgun, Our friend Paul use an ability, a melee one, very similar to Nova in MEA, he jumped and landed with a punch that dealt huge AOE damage via a shockwave. It’s also worth pointing out that on the bottom right is obviously the health and armour, but why the health is split into 3 bars is unknown, maybe it represents 3 fail safes or firewalls. Paul just looted a chest there and I think it’s safe to say that the chest contained 50 Brynnium Shards and not 25 that is multiplied to each person there, The 50 Shards were then divided to each party member equally, so they have group loot of sorts on, One of our friendly neighbourhood Hoth Haulers just got taken down here by bandits with some fairly devastating rockets, It would seem the haulier was on the way to another fortress or colony when these pesky blighters decided they want its cargo. Ok, so these guys are called scars, I’m sure there is thought behind the name, but other than maybe androids that weren’t perfect enough that turned against the state I have no real idea what they are, I’m still convinced they aren’t alien though. Now the abilities, we already know we have normal weapons as well as 3 abilities, our friend Paul has a pretty damn useful Mortar, he’s clearly an AOE spec, Colossus implies tank as does it’s size, the AOE points to this also to keep Aggro on multiple foes, we finally see him use a projectile weapon here and it is a standard Assault Rifle by the looks of it, I see this as being a backup for him as most evidence points to the Colossus being heavily melee buffed. Our main PoV hero, however, uses a Shotgun and has 3 abilities, all of which look long range, The first we saw here is a rocket that can shoot at least 12 enemies in one go and auto locks on and homes in on them, she has 300 of these at the beginning, such a rounded number implies max ammo, but this could easily be upgradable or something, we just don’t know about that yet. the right ability appears to be some kind of projectile fire or maybe a flamethrower, the middle ability is very interesting, it has no ammo counter, it’s icon insinuates AOE lightning, it also requires both bumper buttons which makes me thinks it’s a special ability, It doesn’t make sense that it is a combination of the other 2, but it does seem to lean toward it being an infinite ammo backup ability, that is either on a cooldown so would do insane damage, or it could be a defensive lightning shield that can be held indefinitely or at least for a finite time which then just recharges, or it works like a heat sink and is channeled. The Rockets appear to be in the same place as the mortar on Paul, so that is likely one of the slots, heavy long range projectile weapon. Concept art for the Javelins, show the right arm having very elemental appearances which makes me think that it is the right ability, which would make our PoV hero’s melee a fire one. The middle is unknown but very cool to think about. A few folks seem to think they both got this legendary weapon, I disagree, She said the name, he then said oh nice as if he didn’t know what it was until she told him, not only that but what game drops a legendary item that gives multiple copies out in one go, it’s just not logical. I would say that gold diamond orb she picked up was Anthem’s equivalent of a chest, picking that up will have either started a roll for all group members or just for the one who picked it up, The fact that this item dropped makes me certain this was not part of the original mission and was a random world encounter they fought on the way and I expect has everything else been so far. This quite cool sounding Volt Rifle has weird stats, it’s damage is high, higher than the shotgun, It’s fairly safe to assume that the numbers on screen are the total numbers and the red and green just says whether it’s lower or higher than the equipped shotgun but not by how much, Accuracy is lower, but if you look at its insane rate of fire it makes sense, I believe accuracy and stability are one in the same in this game, the range is lower which is surprising and the ammunition is fairly high. Without the original she is holding, it’s kind of hard to properly infer anything here, for all we know her current shotgun is a way lower level which would fudge some results. Now a random world event called a Shaper Storm just appeared, this feels like a cool open world dungeon type thing, maybe even a raid, but the group of 4 people implies dungeon. It just randomly appeared and they are getting on that right away before other folk come after the loot they called dibs on. An interesting thing about when those 2 just joined, It’s safe to say our main PoV hero is still level 34, a level 31 and 36 just joined, both of their names have an elemental symbol next to them, Sandra is Lightning and Kim is Frost, as abilities can clearly be mixed, I would assume this is down to the suit, the type of javelin they are wearing, in the still you can see that they are both similar to our own ranger suit. The PoV hero as seen here called Michelle has what appears to be a wind or water symbol. If we zip back to a still, right in the beginning, we can see that as we walked up to our Javelin, we passed a Colossus belonging to Shadowjak, who was our Ally of the week, he has the frost symbol and is 7% up but his level is 43, Kim is Frost and is 7% up but her level is only 36, It’s possible the elemental symbols represent a type like Tank, Healer, Melee, Ranged, there may be plenty more types added to this that aren’t in the standard MMO’s. at first, I thought the percentage was gear score, but now I’m not so certain. Michelle has 4% up, so what is it 4% or 7% or 3% above? is it the zone maybe, they out gear the zone by that % It’s definitely not specifically to do with their level as Paul is 2 levels lower but 1% above, Shadowjak is 3% higher than us but a whopping 9 levels higher. Just not enough info on that just yet. The environment appears to react to this random world event with beast running and things setting on fire and more, very cool to see, it also appear that Sandra can fly with greater ease than the rest, whether this is down to her specific suit or class type or is an upgrade augment type deal added to the suit is unknown but shows differences in the suits. Then it ends with them flying into a very cool looking dungeon or raid portal which implies to me that multiple folks can join in on this, multiple groups can fly in and have a go at this time sensitive event. A very cool and informative reveal here, it feels more informative than they intended, but it’s very cool and I’m super excited for it, I will definitely be covering this big time as news comes out and the game it released. So subscribe if you haven’t already, like if you liked, dislike if you didn’t share with your friends and have an awesome day folks! .